Surface mounted bolts including Black Antique for use with the Kirkpatrick range and Grosvenor bolts from Carlisle Brass to compliment our chrome door furniture. 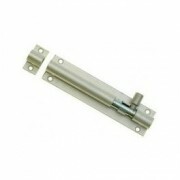 BARREL BOLT STRAIGHT BRASS 32mm wide Lengths 203mm, 254mm, 305mm ..
BARREL BOLT STRAIGHT BRASS 25mm wide Lengths 64mm, 76mm 102mm 152mm ..
Pewter Cranked Fishtail Door Bolt 150mm for outward opening doors. 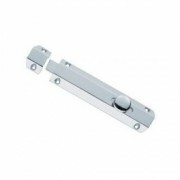 Can be fixed horizontal or vertical and comes with fixing screws Size: Fixing Plate 159x51mm, Receiver Plate 51x25mm ..
Pewter Cranked Fishtail Door Bolt 100mm for outward opening doors. 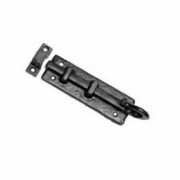 Can be fixed horizontal or vertical and comes with fixing screws Size: Fixing Plate 90x36mm, Receiver Plate 32x19mm ..
Beeswax Cranked Fishtail Door Bolt 150mm for outward opening doors. Can be fixed horizontal or vertical and comes with fixing screws Size: Fixing Plate 159x51mm, Receiver Plate 51x25mm ..
Beeswax Cranked Fishtail Door Bolt 100mm for outward opening doors. 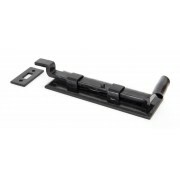 Can be fixed horizontal or vertical and comes with fixing screws Size: Fixing Plate 90x36mm, Receiver Plate 32x19mm ..
Pewter Straight Fishtail Door Bolt 100mm for inward opening doors. 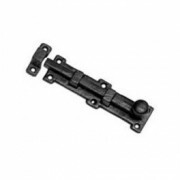 Can be fixed horizontal or vertical and comes with fixing screws Size: Fixing Plate 90x36mm, Receiver Plate 41x16mm ..
Beeswax Straight Fishtail Door Bolt 100mm for inward opening doors. 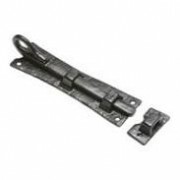 Can be fixed horizontal or vertical and comes with fixing screws Size: Fixing Plate 90x36mm, Receiver Plate 41x16mm ..
Pewter Straight Fishtail Door Bolt 150mm for inward opening doors. 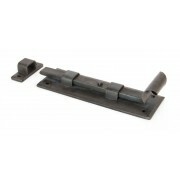 Can be fixed horizontal or vertical and comes with fixing screws Size: Fixing Plate 159x51mm, Receiver Plate 54x16mm ..
Beeswax Straight Fishtail Door Bolt 150mm for inward opening doors. 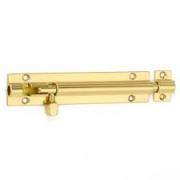 Can be fixed horizontal or vertical and comes with fixing screws Size: Fixing Plate 159x51mm, Receiver Plate 54x16mm ..
Carlisle Brass Grosvenor Door Bolt is made of solid brass and plated with chrome 150mm. 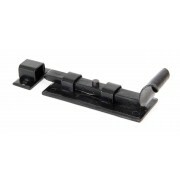 Supplied with matching wood screws and 3 different keeps for various applications. Available in Polished or Satin Finish. ..